The nuclear-powered USS Gerald R. Ford undergoing sea trials last July off the coast of Virginia. 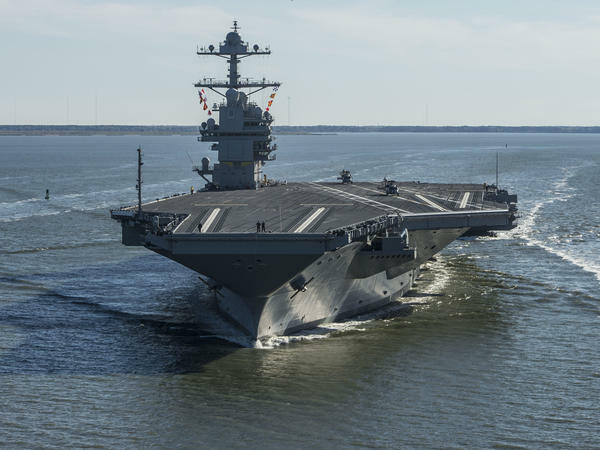 The Ford is the first in the Navy's new class of aircraft carrier. We've been talking with a man whose job is to help spend $700 billion. That is the approximate size of the military budget after a massive increase. We arranged to meet him inside one of the world's most massive office buildings. Pentagon spokesman Jeff Davis led us toward his office down one of the long, long corridors at the Pentagon. JEFF DAVIS: Six-and-a-half million square feet of office space, and there are about 26,000 people who work here. INSKEEP: It's the headquarters of a worldwide operation, and the job of overseeing it all falls to Jim Mattis, the secretary of defense. His No. 2 was the man we were walking to meet. PATRICK SHANAHAN: Steve. Pat Shanahan. Nice to meet you. INSKEEP: Patrick Shanahan is a former executive at Boeing. He built airplanes. Now he oversees an agency that buys thousands of airplanes and other hardware and employs more than 2 million people. It is the nation's largest employer. Decades ago, one of those employees was his father, whose picture is in Shanahan's office. SHANAHAN: I remember I only saw my dad cry once in his whole life, - he's a real tough guy - and it was right before he went to Vietnam, he left his family. INSKEEP: Decades later, the younger Shanahan seized on the chance to work for the military as a civilian. He has what he views as an exceedingly rare opportunity. 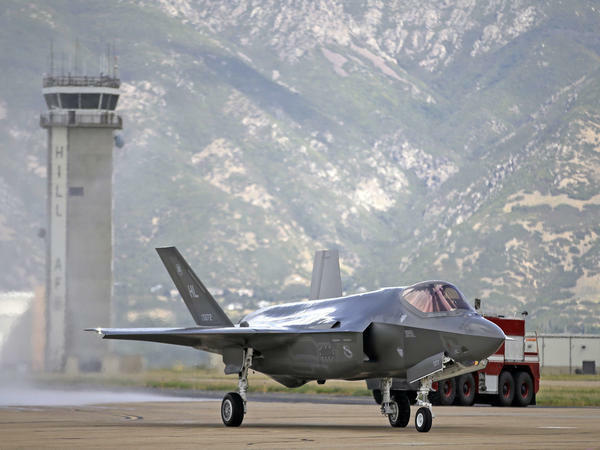 At President Trump's request, Congress added some $60 billion to the military budget. Almost never does the budget rise that much when there's not a major war going on. Shanahan wants to plan for the next few decades, and he is conscious that some of the money will seem to be wasted. In the last big buildup, in the 1980s, there were famous stories of the Pentagon paying hundreds of dollars for a hammer. SHANAHAN: Guess what? There's probably going to be a $600 hammer because somebody, you know, was trying to do something quickly, and they make a mistake. INSKEEP: Shanahan says that in the end he just wants to know that spending is effective as the Pentagon executes thousands and thousands of military contracts. SHANAHAN: I think the math on this is a little over $300 billion a year. So, you know, about a billion dollars a day. And I'll bet you we could find a mistake, but just think of the volume. INSKEEP: We can find some. INSKEEP: ...Which has been examined and investigated. I'm sure you know this. And it was found that there were problems with a lot of critical systems. The catapults that launched the airplanes off the deck, for example. This is a multibillion-dollar aircraft carrier that seems to be having problems launching airplanes, catching airplanes, firing weapons, almost every critical system. What do you think, about as a manager, when you discover something like that? SHANAHAN: Well, it's funny. As you're describing it, I'm like, well, that's normal. You always find problems when you're doing development. The fact that you wouldn't find problems, it means you didn't take enough risk. INSKEEP: Patrick Shanahan's ultimate goal in managing the world's largest military budget is to focus on future potential threats. As everybody knows, China has been building up its military forces. And there's a degree of tension in that relationship. How does that affect your thinking here? SHANAHAN: We think of China, as we see their growth in the military, their theft of intellectual property, we see all of those things as disruptive and, you know, threatening to the American way. INSKEEP: Which I guess you had to deal with at Boeing long before this job. SHANAHAN: Well, they were one of our biggest customers, as well. So here it's a lot easier in that regard. But their investment in military capability is different than where we've invested in the past so it certainly changes our calculus. INSKEEP: I was thinking about the fact that the Chinese have aircraft carriers. The United States hasn't had to worry about another nation with a serious aircraft carrier fleet in a long time. Suddenly, they have aircraft carriers. You're thinking beyond that. You're thinking about what they do in space. What is your concern about what China does in space? SHANAHAN: Space was always a sanctuary. It was a place where you didn't have to protect your assets. It was a place that you could operate freely. That's not the case anymore. And since so much of our commerce and way of life is affected by our use of GPS, sharing of communications, sharing of data that we need to make sure we're protected and that we have resilience so that we can continue day-to-day operation of our businesses and defensive systems. INSKEEP: And so really the fact that we haven't had some significant space-based attack may solely be because we haven't had one yet. SHANAHAN: Because we haven't had one. So do we assume that it will continue just as it has in the past, or should we safeguard this important infrastructure? INSKEEP: What are you doing about that? SHANAHAN: ...Swap it out. That's a one-way trip. So, you know, the things that we've - you know, have on orbit are the things that we have on orbit. But when you think about our future systems and the new satellites that we'll put on orbit, they'll be capable of withstanding, you know, jamming and all sorts of other effects that malicious actors may try to deploy to disrupt our way of life. INSKEEP: What are other future threats on your mind? SHANAHAN: Well, the threat spectrum ranges from how do you motivate and make sure that we take advantage of what we do have right now that's so precious? We have time to solve a lot of these problems. We have time to invest in security. INSKEEP: What do you mean by that? Meaning we're not at major war now? SHANAHAN: Right. Exactly. Prepare for a cold winter, for a short period. Who knows how long the budget will last? Make the most out of it. You know, developing these weapons systems and thinking about the future, this isn't the, you know, freshman econ class. This is the Ph.D. physics class. And having the time and involving the leadership that's seen the world for 30 or 40 years, they know how the world works, and they really do have a sense for risk and technology. Taking advantage of what we have right now to lay the foundation is the most important work we can do. 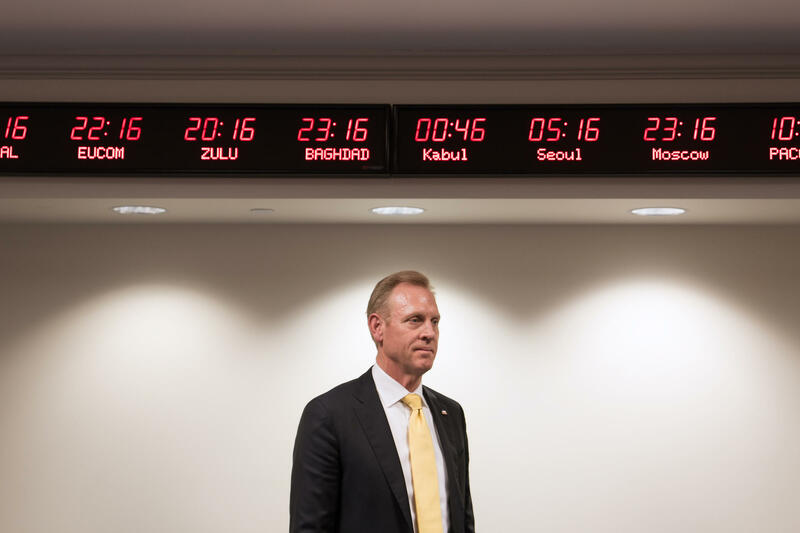 INSKEEP: Patrick Shanahan, the deputy secretary of defense, spoke earlier this week at the Pentagon. Now the windfall his agency received is not without controversy. It is part of the reason the budget deficit is expanding. Shanahan just wants to be able to say afterward that the military spent the money well. Transcript provided by NPR, Copyright NPR.